Hartford, CT (USA) -- Buddhist monks were shot down by the state Supreme Court on Wednesday in their bid to build a temple in Newtown. << "The monks are devastated, I do not know whether they can recover from this. This was one of their last possible hopes for having a temple" - Michael Ziska, lawyer representing the monks of the Cambodian Buddhist Society of Connecticut Inc. The Cambodian Buddhist Society of Connecticut Inc. wants to build a temple and meeting hall on 10 acres it owns on Boggs Hill Road. But in 2003, the Newtown Planning and Zoning Commission denied the application. 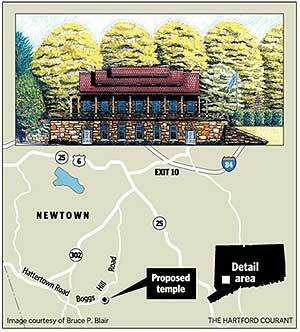 The society appealed, but the state Supreme Court unanimously rejected its argument that Newtown violated laws protecting religious freedom in denying a permit for the temple. The lawyer for the monks, Michael Zizka of Hartford, said they are disappointed and haven't yet decided whether they will try to appeal to the U.S. Supreme Court. "They are devastated," Zizka said. "I do not know whether they can recover from this. This was one of their last possible hopes for having a temple. "I don't think there is any question it will harm their ability to maintain their religious practices," said Zizka, who is representing the monks at a reduced rate. "I'm hoping there is some town that has a bigger heart than Newtown." "We thought we had the better argument from a legal standpoint," Zizka added. Zizka said the monks, who live on the property, would like a temple there as well. "These are people with very limited resources. They have been putting all their time, their resources, their energy into this," he said. "They lack a true place of worship. What they have is catch as catch can. "This is so important to this faith and people say, 'Not in my backyard. Do it someplace else.'" Zizka said Newtown officials would be happier if the monks put a temple downtown, but they need a rural setting with a pond. "They need a quiet, spiritual area," Zizka said. In denying the society, the commission said the temple would be inconsistent with "reasonable expectations of noise and activity that a quiet rural neighborhood should not have to tolerate." The denial also said the planned Asian style of the temple was not in line with neighboring New England architecture. Tom Beecher, the lawyer for five families who live near the proposed temple site, said the case "wasn't about religion at all." Beecher said his clients' concern was not only the noise and traffic congestion of weekly services, but the noise and traffic that 12 annual festivals, expected to each draw about 450 visitors, would bring. "The issue in this case was the intensity of the use in a residential neighborhood on a small windy road in Newtown, and they would have had the same objections if it was a church or a convenience store," Beecher said. "It wasn't about religion at all." After hearing the state Supreme Court decision Wednesday, Beecher talked to one of his clients, Jeanette Coburn of Boggs Hill Road, whom he said was "extremely happy." Robert Poulin, who was a member of the Planning and Zoning Commission when it denied the application, said, "We didn't have any objection to having a Buddhist temple in town. We just thought the location was inappropriate." "There were sewer problems. It was a 6-acre lot," Poulin went on. "It has a stream running through it, splitting it into two three-acre lots. We could anticipate a lot of problems with parking. "Basically, it was too much activity for a small lot." Robert Fuller, the lawyer for the town, said the main problem the commission had with the temple was "compatibility with the neighborhood."